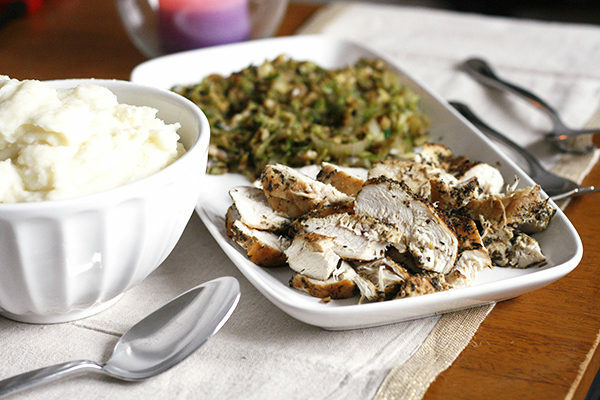 Ready in about 30 minutes, this elegant meal couldn’t be easier — and Herb Chicken Breasts with Brussels Sprouts Hash and Mashed Potatoes is perfect for celebrating life’s special moments. This post is sponsored by Idahoan, but all opinions are my own. There’s been a lot to celebrate lately. My kids, who just finished their third quarter at school, have gotten amazing grades all year long. I just agreed to teach classes in the fall at two local universities. Plus, spring is coming. I mean, yes, I know technically we’re in the season of spring but when you live in Maine spring begins when you trade the snow boots for muck boots. It’s still snowing here now though, and probably will a few more times. But soon warmer weather will prevail, the snow banks will melt, and mud season will commence. Easter will be here soon too. What are you celebrating these days? Whatever you’re celebrating, this meal is for you. It’s simple and elegant, but also so, so easy — and ready in about 30 minutes. (That alone can be worth celebrating.) And one of the things I most love about it is that it takes only two pans — one to cook the veggies and chicken in, and one for the potatoes. That means less cleanup, less dishes to wash and more time for just enjoying some time with your loved ones. To make this, you start with the veggies. 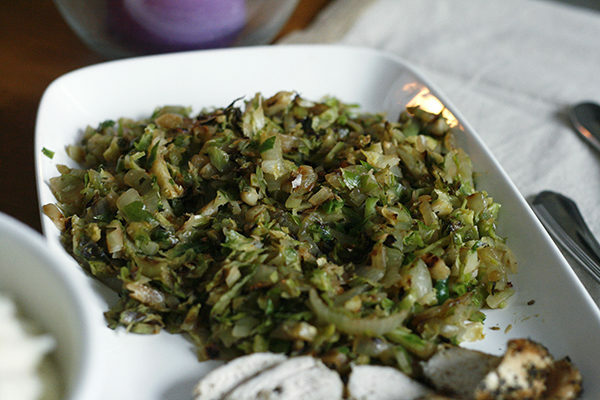 Onions and shredded Brussels sprouts are sauteed in a little olive oil to make a tender hash, seasoned with salt and pepper. 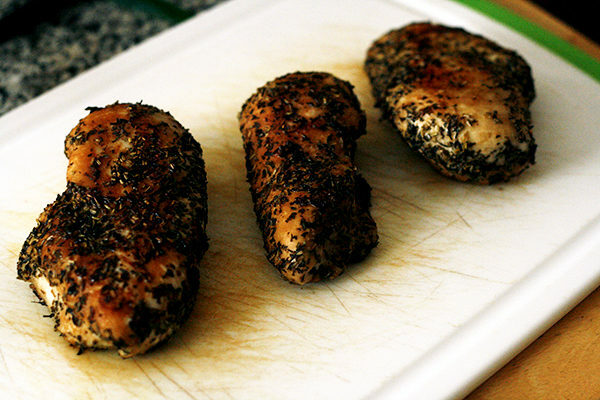 Chicken breasts are rubbed with a garlic-herb mixture and then cooked in a skillet to juicy tenderness. 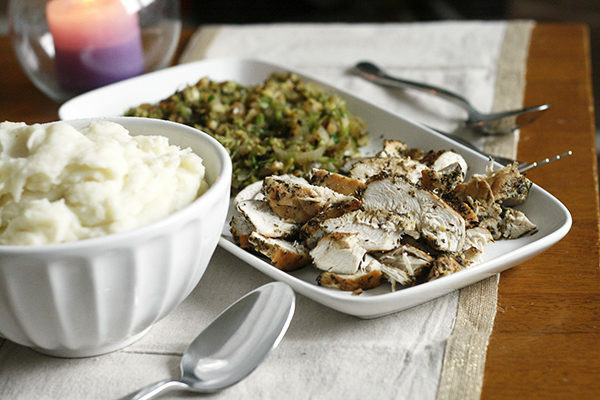 And mashed potatoes make this a comforting, homey meal. 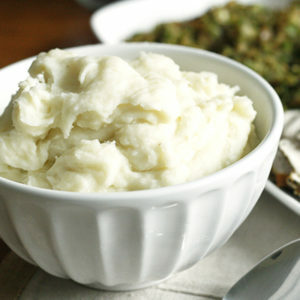 But these aren’t just any mashed potatoes. They don’t require peeling and won’t take you long to make. 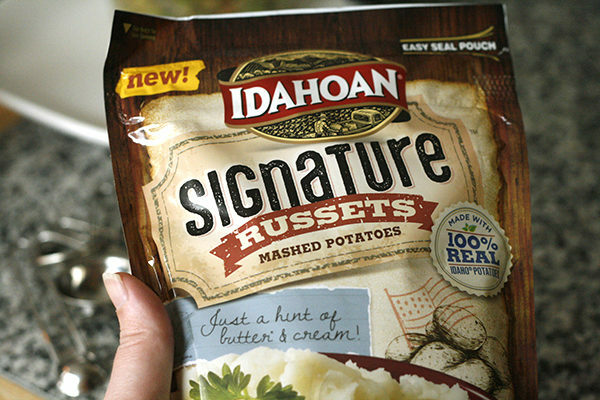 They’re a super easy version, but delicious and taste just like homemade — Idahoan Signature™ Russets Mashed Potatoes. Made with a proprietary drying method to ensure the potato’s flavor and texture, these cook in about five minutes and are so smooth and buttery, and taste just as good as if you personally peeled, boiled and mashed them yourself. 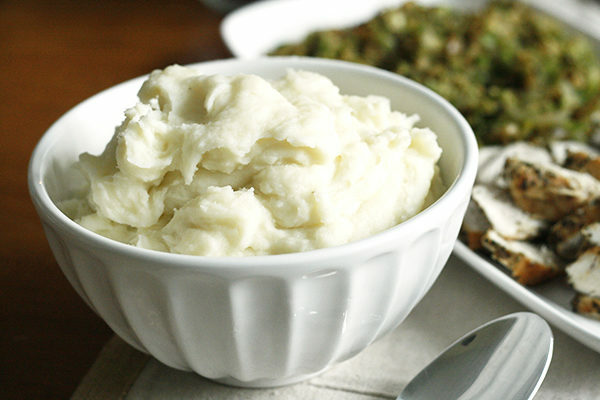 What I especially like about Idahoan Signature™ Russets Mashed Potatoes is that you can make as little or as much as you like. The re-sealable pouch keeps the mixture fresh until you’re ready to use it … and make any day taste like Sunday. Heat olive oil in a large skillet with a cover set over medium heat. Add the onion and season with salt and pepper. Cook, stirring occasionally, for 3-5 minutes until beginning to soften. Add the Brussels sprouts, stir well, and season with additional salt and pepper. Cover and cook for 10-15 minutes, stirring occasionally, to desired doneness. Meanwhile, stir together the salt, basil, rosemary, thyme and garlic powder. Sprinkle all over the chicken breasts. Set aside. Wipe out the pan and return to the burner. Add 1 tbsp olive oil to the pan, and heat. Once warm, add the chicken breasts to the pan. Cook for 5-7 minutes per side, until opaque. Pour 1/3 cup water into the pan, cover, and cook for an additional 10-15 minutes until the water is evaporated. Remove from the pan, set aside and let sit for 10 minutes before slicing thinly. 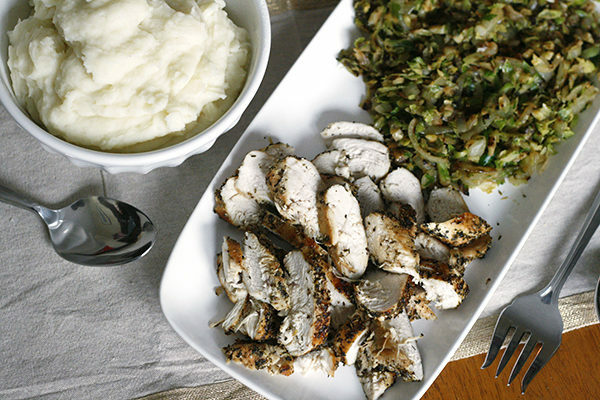 Serve the mashed potatoes in a bowl, and the Brussels sprouts and chicken on a platter, allowing guests to select their own portions. P.S. Be sure to follow Idahoan on Twitter, Facebook, Instagram and Pinterest — the company is @IdahoanFoods. This is also perfect for Passover next week!